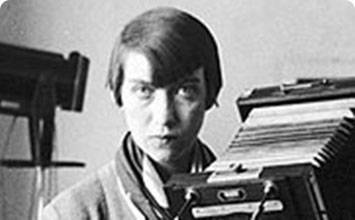 Berenice Abbott was an American photographer known for her portraits and documentary photographs which stressed the communicative, even educational value of the photographic print. She pursued a realist vision in recording history and her own historical experience in order to potentially affect change in her audience. Her photographs purposely facilitated the interaction and dialogue between the photographer, the photographic print, and the viewer. Abbott's realist approach to photography stems from her career as a portrait photographer in Paris as well as the influence of Eugène Atget's photographic realism. After eight years in Paris, Abbott moved to New York in 1929 to document the modern transformation of the city. The resulting book Changing New York (1935-1938) received critical acclaim and has continued to resonate to this day. For Abbott, the photographic image had to be honest, contingent, and objective to be communicative. 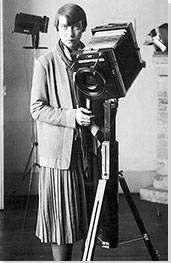 In her own words, straight photography is: "precision in the rendering and definition of detail and materials, surfaces and textures; instantaneity of observation; acute and faithful presentation of what has actually existed in the external world at a particular time and place." Abbott identified how photography, in particular science photography, could act as a friendly interpreter of the world to laymen and women. She accomplished this task through her photo book on Changing New York that summarized the city's modern transformation, and her science photography. Her ability to capture scientific subjects and endow them with popular appeal and scientific correctness enabled her to make physics visually comprehensible. As collector and guardian of Eugène Atget photographic archive, Abbott performed her most significant task in preserving the legacy of this early modern photographer. She tirelessly promoted his work for more than forty years. And it is because of Abbott's efforts that Atget is still known today. Interactive chart with Berenice Abbott's main influences, and the people and ideas that the artist influenced in turn.